When cooking quick and easy meals, one of the easiest ways to up the flavor without upping the effort is to use a flavorful seasoning blend. Unfortunately, so many seasoning blends are not gluten-free. When I realized gluten was hiding in my seasoning blends, I freaked. But soon I realized I could make my own super easily with minimal effort. 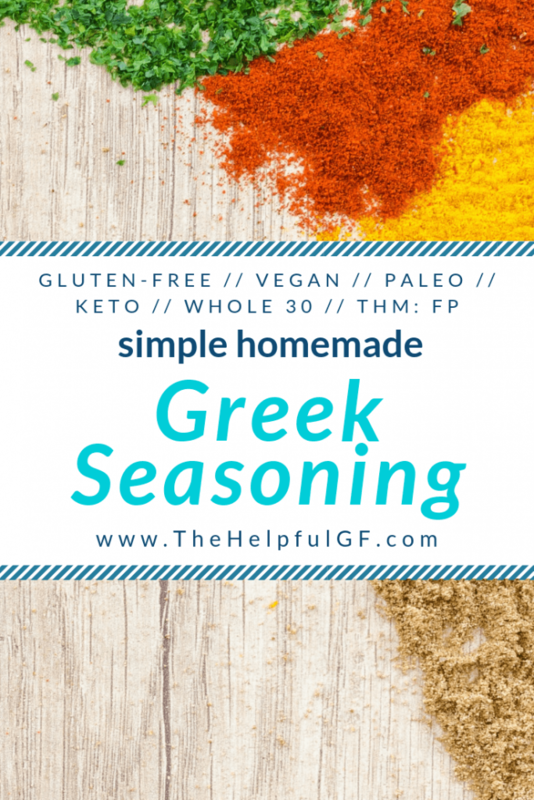 And now I share with you my super-simple recipe for gluten-free homemade Greek seasoning! This post contains affiliate links. If you order through one of these links I’ll earn a small commission at no extra cost to you! My full disclosure isn’t that interesting, but you can find it here. So what’s the deal with spices and gluten? While individual spices (you know, single spices like paprika or dried herbs like parsley) are naturally gluten-free, many become cross-contaminated with gluten during the manufacturing process. This is due to processing on equipment shared with gluten-containing items. Honestly—we’ve had black pepper that states a “manufactured on equipment with wheat.” ugh. Want to know more about gluten cross-contamination? Click here! In addition, seasoning blends often use gluten-containing ingredients (such as wheat flour) as a binder or a thickener in their blend. What spices and seasonings are gluten-free? 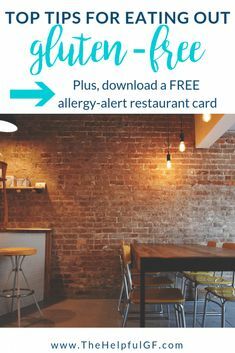 Badia Seasonings (individual spices & seasoning blends)—these are actually certified gluten-free, so there’s an extra level of safety & comfort here! They also are very cost-effective and can be purchased on Amazon or in your neighborhood grocery store. 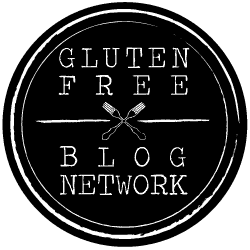 –> Do you want to know more about what gluten-free certification means? Click here! Penzeys Spices (individual spices & seasoning blends)—Penzy’s spices are high quality and they have so many creative and interesting spice blends. Penzy’s spices can be purchased on Amazon, at Penzy’s retail stores, and their website. Primal Palate (individual spices & seasoning blends)—these spices are great and their seasoning blends do not contain artificial fillers. These are available at Amazon and are also discounted on Thrive Market. 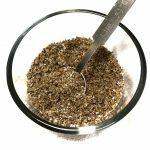 Spiceology (seasoning blends)—Spiceology’s seasoning blends are flavor explosions! They are a bit difficult to find at brick and mortar stores, but are available at Amazon and some blends are discounted on Thrive Market. Note: I love shopping online through Thrive Market! You can save a ton of money on specialty items. Learn more about why I love Thrive Market in this post and get a free trial + save 25% off your first purchase. 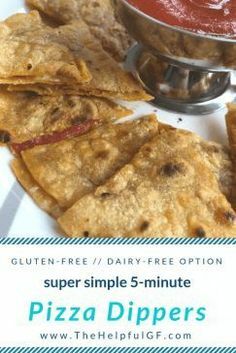 Are you ready to do gluten-free living totally STRESS-FREE? 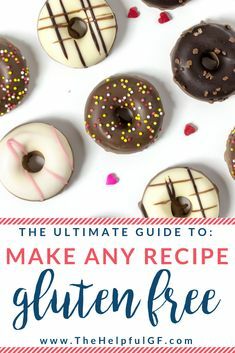 Get FREE instant access to my online library of free printables including a meal planner template and shopping list designed to make your gluten-free lifestyle totally easy! 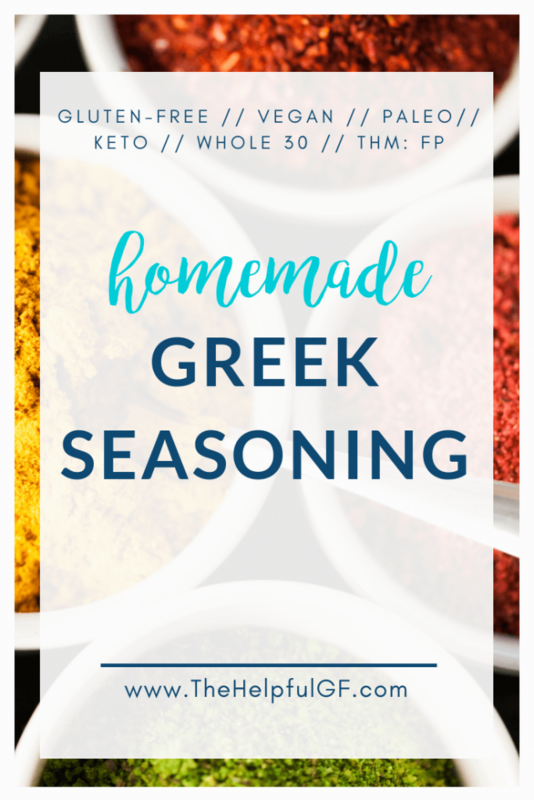 Back to the homemade Greek seasoning recipe! Click to see these spice jars on Amazon! They are so cute–with little labels and everything! 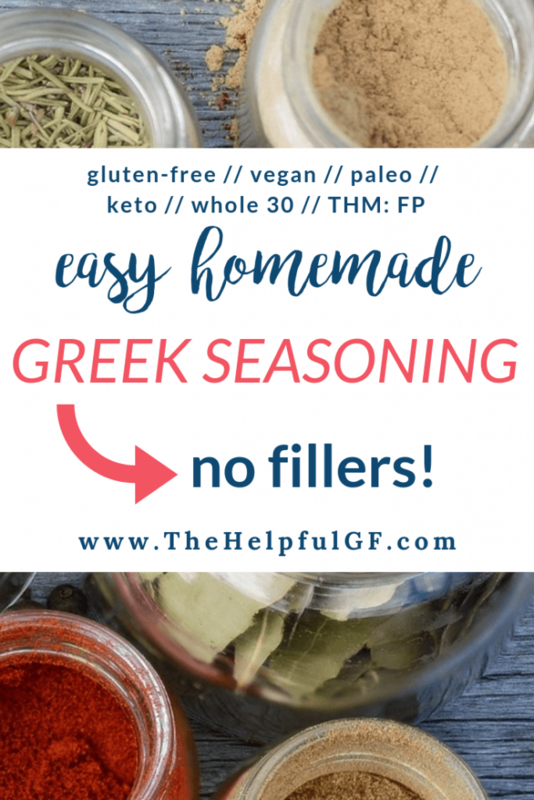 To make this homemade Greek seasoning, all you need is a couple different basic spices—many of which you probably already have in your pantry! Just make sure the spices themselves are gluten-free. I like to make it in bulk and store it in a spice jar (or mason jar if I really make a lot!) so I have it ready for super quick cooking! note: I personally order my spice jars from Brandless.com. 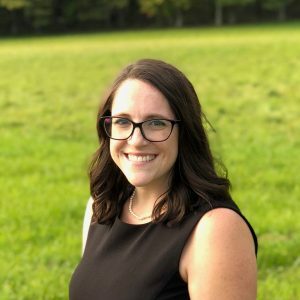 If you haven’t tried Brandless it is fantastic–everything is $3 (or less!) and they have a great selection of gluten-free products. Click here to try it out and you’ll save $6 off your first purchase! 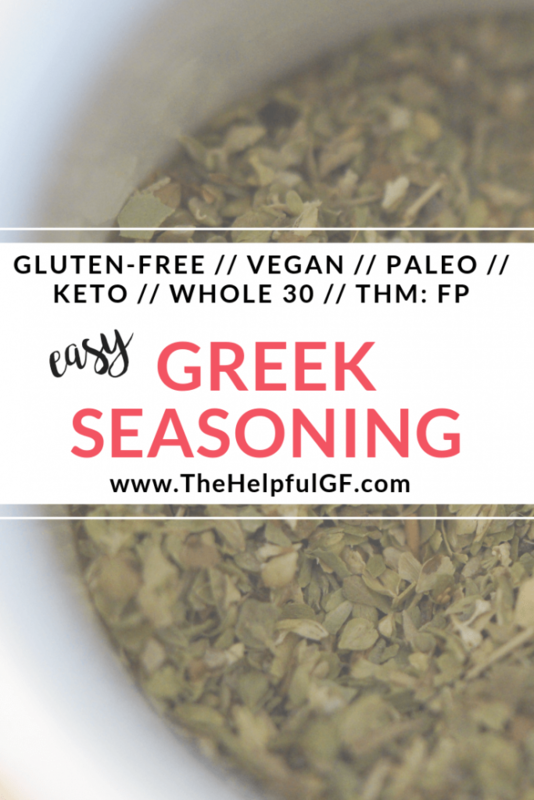 This gluten-free Greek seasoning blend is so versatile. I use it to make salad dressing for easy Greek salad. I marinate chicken with it, drizzle it on roasted vegetables. 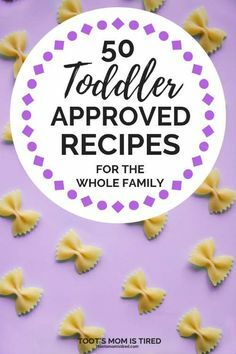 Don’t forget to pin this recipe on Pinterest so you can find it when you want it!